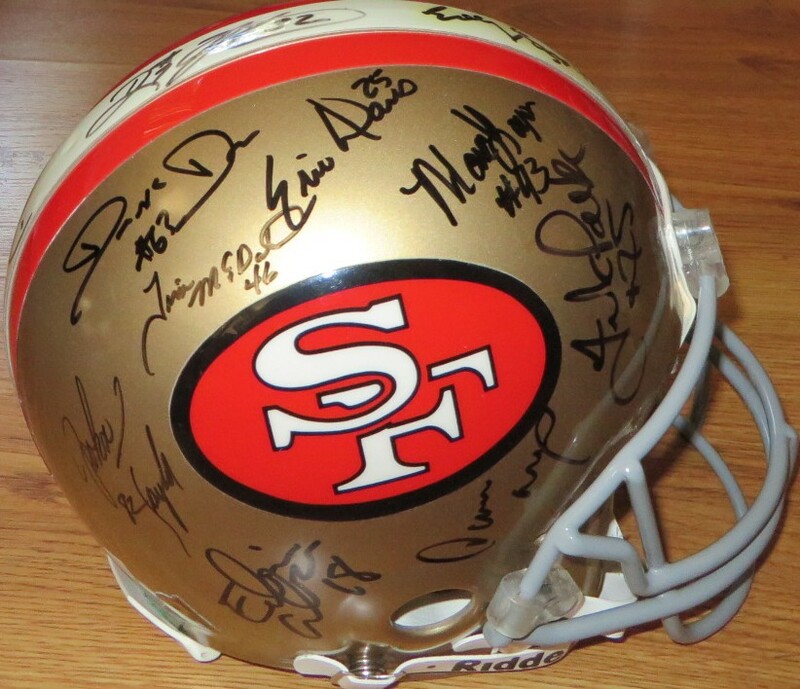 San Francisco 49ers Riddell full size AUTHENTIC (NOT A REPLICA) Pro Line game model throwback helmet autographed in black marker by 19 members of the Super Bowl 29 Champions 1994 team including Hall of Famers Jerry Rice, Deion Sanders, Steve Young and Rickey Jackson; plus players Elvis Grbac, Eric Davis, Ricky Watters, Marc Logan, Tim McDonald, Lee Woodall, Jesse Sapolu, Derrick Deese, Frank Pollack, John Taylor, Brent Jones, Nate Singleton, Troy Wilson and coaches Dwaine Board and Tom Holmoe. 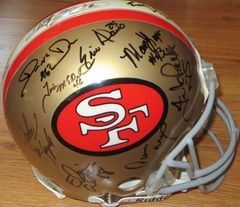 There is one additional autograph on the white stripe that is unidentified. 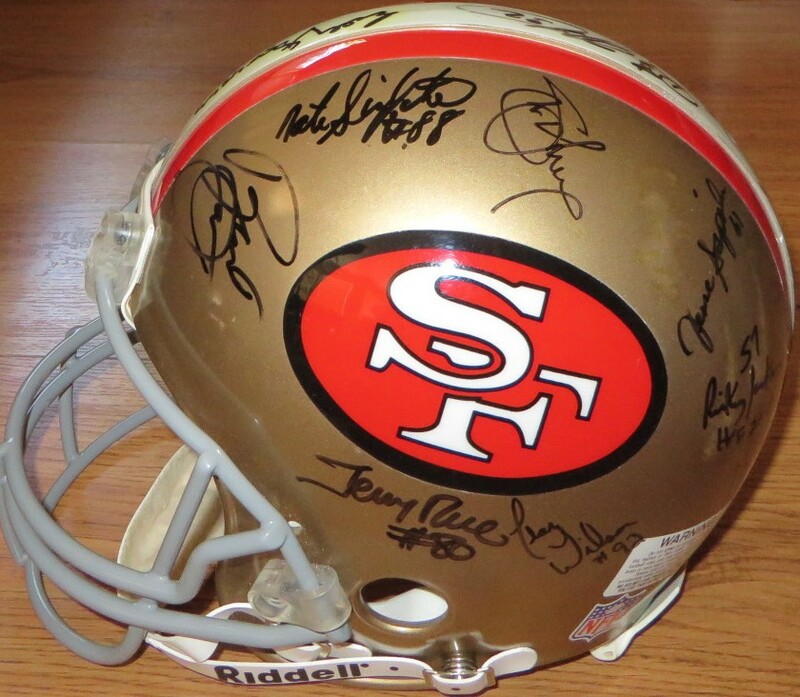 NOTE: HELMET HAS MINOR NICKS AND HANDLING FLAWS COMMON FOR A HELMET OF THIS AGE. 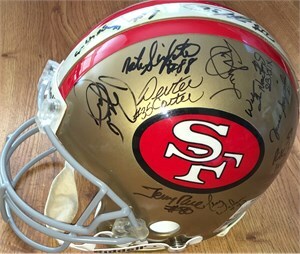 Buyer will receive roster marked with every player who signed the helmet. With certificate of authenticity from AutographsForSale.com and Denver Autographs certificate of authenticity for Rickey Jackson. ONLY ONE AVAILABLE FOR SALE.